Generally the room which is the largest in a house is the master bedroom. This room can be designed very well because of the amount of space available. However, if it is not designed properly it can make the whole house look bad. Hence, utmost care must be taken to create a wonderful master bedroom. A bedroom is a place to relax and enjoy a peaceful atmosphere and a master bedroom design idea should ensure that. For a peaceful atmosphere it is necessary to have cool colour tones in the bedroom. Harsh colour tones create a harsh environment. It has been scientifically proven that red or its derivatives create anger and ill will, whereas pastels and other cool colour create a peaceful environment. Use cool colours for the walls and if you do not want to paint the walls, you can choose wall paper. There are many wonderful wall paper designs for every type of wall and you can select one that suits your bedroom. Along with the bed you can add matching furniture like a couch or ottoman. Add such furniture only if you want to, because a master bedroom with only the essentials will look good, just adding furniture for the sake of using space is not a good idea. A cluttered bedroom will not allow you to relax. 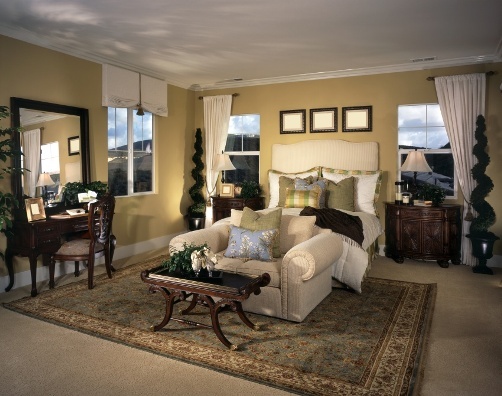 A master bedroom needs natural light. Natural light should enter the bedroom as it alleviates depression. So the windows should be draped with sheer material for the light to filter through. Also you should not place any furniture near the windows as natural light and air flow will be blocked. Ventilation is very important for the master bedroom and hence keeping minimal furniture in your master bedroom design will help air flow too. The most important master bedroom accessory is the mattress. There are many types of mattresses available in the market and you should select the one that relaxes you completely. A mattress which exacerbates your back pain will make you hate your bedroom. You should feel completely at home in the master bedroom and hence you need to spend money on a good mattress. Additional add-ons like paintings should capture the mood of the resident. Lighting is very essential. The desk lamps should match the furniture and the overall master bedroom décor. It is always better to refrain from too much lighting. Soft lighting is great for relaxation and hence you should opt for soft lighting. Carpeting the floor is also a good option and rugs can also be an alternative if you do not like wall to wall carpeting.